In 2000 English Heritage launched their Campaign for London Squares to find funding and involve owners and managers in the restoration and enhancement of squares. The campaign led to several major restorations, backed by the Heritage Lottery Fund, local authorities and others. These were Redcliffe Square and Cleveland Gardens, and five squares in Bloomsbury, including Russell and Bedford Squares. A number of private squares have also been restored by their residents in recent years, including Fassett Square in Hackney and Bonnington Square in Vauxhall. Railings have been put back in many squares, some reproduced using old pictures and photographs from before WW2. The earlier threats to squares have receded, but others have taken their place. Underground car parks are less of a problem, but today's 24-hour 'café culture' is putting central London squares under new pressure, with schemes to pave over the grass in some, or to use them as entertainment venues. Over the past 400 years, London's squares have helped the capital to make its mark as a world city. They attract tourists, offer breathing space for London's residents, workers and visitors, and can be a sanctuary for wildlife. London's squares are unique. We must continue to cherish, protect and improve these irreplaceable green spaces for the continued well-being of the city. Brunswick Square, laid out in 1799, is a Grade II listed site. The square had suffered from neglect and become a magnet for anti-social behaviour. 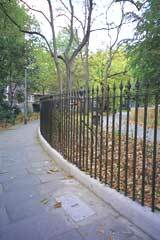 English Heritage and the London Borough of Camden worked together to repair paths and other surfaces and reinstate the impressive railings and gates, making the square far more open and attractive. 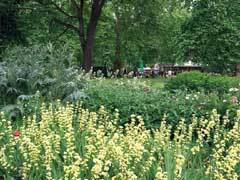 London's squares form vital links in the ecological chain between parks and back gardens, and are home to many species of birds, butterflies and other insects, as well as small mammals. The dense, well-established shrubberies and mature trees of the older squares create vital cover for birds to nest and feed, and are home to over 30 species, including song thrushes and woodpeckers. Garden squares, particularly the private ones, lend themselves to being managed in a wildlife-friendly way, with abundant mature vegetation, plenty of ivy and areas of long grass and uncultivated ground, where wildflowers can grow. If a Square was planted in the Manner of a Wilderness it would be a Harbour for Birds. The square has continued to be popular among architects and developers in the 20th century. 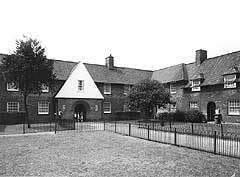 The cottage estates (right) and garden suburbs built by local authorities and philanthropists in the early 1900s included generous communal green spaces well as private gardens, and many new estates continue to be built around squares and communal gardens. 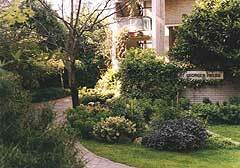 Span Developments in the 1950s used the principles behind squares, by combining low rise, high density housing with leafy communal spaces, and setting up residents' committees to manage the maintenance of the gardens. In the 1970s, developments such as Lillington & Longmoore Gardens and St George's Fields (right) saw dynamic modern architecture set in extensive communal gardens. Today, the traditional square is still used in both the private and public sectors. At Canary Wharf, one third of the development is devoted to public open space, with a network of squares, large and small. Current high profile developments include New Street Square, Swiss Cottage Square and Highbury Square.